Way out at the tip of Pier C just south of the Milwaukee Yacht Club, on the bow of the “Kristin Marie,” an easel holding a canvas stands tall. The boat — a 44-foot 1969 Islander restored to glory by its owner — and the canvas, roughed in with preliminary sketches, belong to artist Curt Crain. Or maybe he belongs to them. The Kristin Marie, named after his wife, is as much a part of the artist’s physical and emotional toolbox as his brushes, acrylics and oils. Whether it’s tethered to the dock or its sails are billowing, the boat takes Crain out to moments he feels compelled to capture. 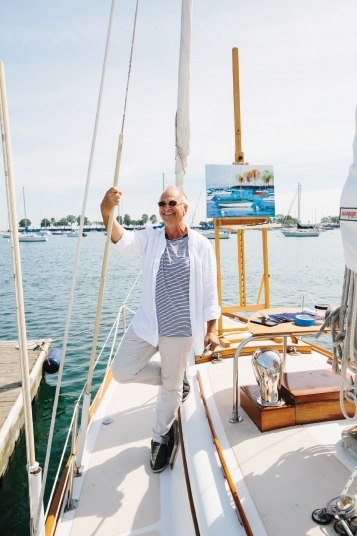 So he drifts and paints, occasionally dropping anchor to get a steadier view — of the harbor, the Milwaukee skyline, and sleek vessels in brilliant sunshine and moody fog. “I love the smell of the lake; it doesn’t matter how rough or calm,” Crain says. Not all of Crain’s work is done on his boat. Some of the lake images are views from his home studio in Whitefish Bay. 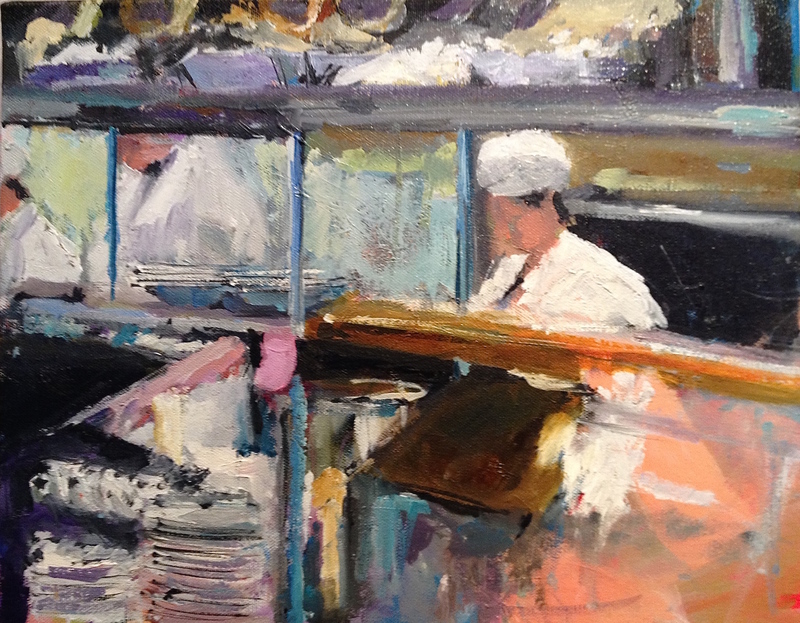 Others are scenes M readers will recognize — a bistro kitchen, street scenes, the Riverwalk. There is also a series of lush florals, ballerinas and children playing ice hockey and romping on the beach. He paints in quick strokes and bold, clear colors. He paints so prolifically that many of the pieces are done on top of earlier works. The paintings often reflect Crain’s joy in simply being in places or with people he loves. “I don’t have a lot of angst in my work,” he says, with no apologies. Crain does portraits too, and an installation of his individual paintings of 75 men is on display at the All Saints’ Cathedral in downtown Milwaukee. He considers all of the men his mentors. “That was a ton of fun. I gave each of (the paintings) two hours because I didn’t want to favor one man over another. I learned a little something from all these guys,” he says. Sometimes opportunity comes when he least expects it. During an art show in New York, a woman dressed in all black hustled over to his booth and gave him her card, saying she was in a hurry but wanted to talk. She was a set designer, and when she called him days later, she said she wanted to use one of Crain’s paintings in a movie starring Eric Bana and Olivia Munn, the 2014 film “Deliver Us From Evil.” Once the designer received the painting, she ordered a second Crain creation to decorate the set. Crain says he considers himself a painter, not necessarily an artist. As a young husband and father, he realized that his art was not going to pay the bills, so he worked as a house painter. He sees very little difference in the final result of painting a house or painting one of his trademark lake scenes: “The point is just making people happy, with a painting or the transformation of a house,” Crain adds. Although he studied painting under Laurence Rathsack at UW-Milwaukee, a professor he revered, practice and Lake Michigan are among Crain’s most important teachers.